Visual Studio 2017 solution. Includes C# and VB source code. This tutorial shows how to use DayPilot ASP.NET Calendar in a web application. It includes both C# and VB.NET version. Create a new web site in Visual Studio. Create a Bin directory in the web site and copy DayPilot.dll there. Add a new page to the site (Default.aspx). We will load events from the DB to the Calendar during the initial web page load. We will update the DB to actually move an event and send an updated event set back to the client. In this tutorial, we are using SQLite embedded database and SQLite ADO.NET Provider to limit the external dependencies (both the ADO.NET driver and the database engine are in a single file - System.Data.SQLite.DLL - in Bin directory). 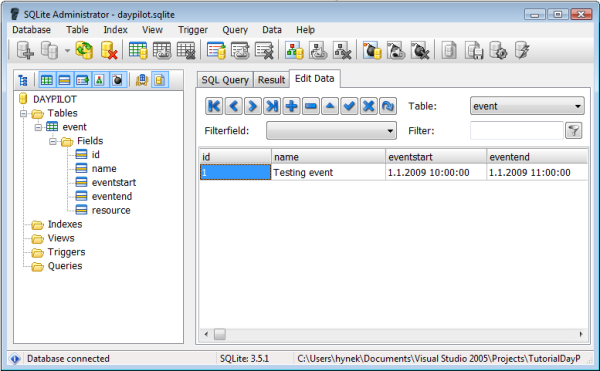 The database file (daypilot.sqlite) can be found in App_Data directory. The database structure can be examined using SQLite Administrator. ASP.NET WebForms web application that links the ASP.NET event calendar control with a Navigator (date picker) control. This tutorial shows how to create a print page for the event calendar and open the browser print dialog. Includes sample C# and VB ASP.NET projects. ASP.NET project that demonstrates how to use Calendar and Scheduler controls to manage a simple shift schedule. Supports recurring events and conflict detection. 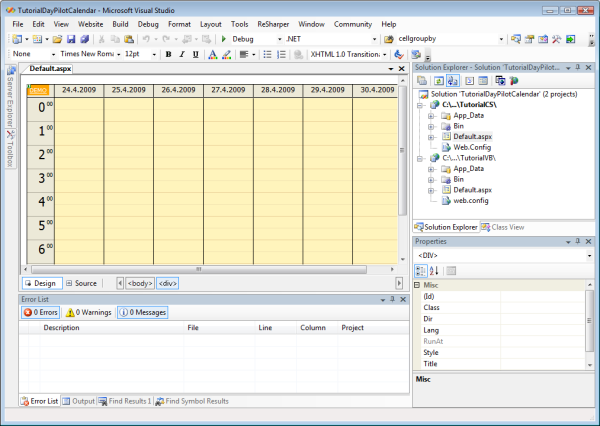 ASP.NET web application for managing a weekly timetable. Supports AJAX operations. Customizable time slots.